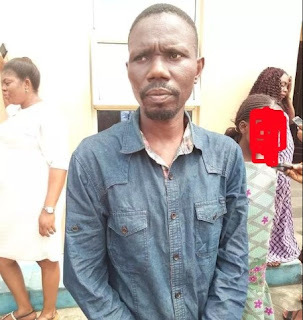 The Police in Akwa Ibom State has arrested a 45 year old man, oneJoseph Sunday Essien for allegedly defiling his 13 year-old step daughter, one Patience Edet Edem. The suspect was said to have committed the crime on January 13, 2019 in his Ifa Ikot Obong village, Uyo LGA. Parading the suspect today at the State Police Command Headquarters, Ikot Akpan Abia, Uyo, CP Musa Kimo said that the wicked father carried out the heinous act in the girl’s apartment he gave to live. Confirming the defilement, the victim said that her step father lured and slept with her on four occasion until the bubble busted when her mother who earlier didn’t believe when her daughter informed her, caught his randy husband red handed. The wife who has born two children for her husband then reported the act the police who eventually arrested him. Collaborating her daughter statement, the mother of the victim said that her husband on the fateful day, left her in their bedroom and sneaked into the girl room to carry out the act. She said that she lost her former husband and father to the victim to death. The wife who has vowed never to return the matrimonial home, described the randy husband as wicked. But speaking with newsmen, the suspect said that his wife and daughter made the allegation as a result of issues they had. He however refused to say what took him to the girl room in the middle of the night. Similarly, one Edet Inyang Edem has been arrested for defiling a 10 year old minor, one Mfon Sunday Okon and after the act, abandoned the victim at Use Offot market square, Uyo LGA. The middle aged man allegedly committed the crime on January 13, 2019.